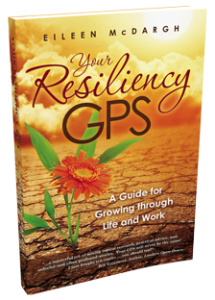 I am pleased to start out this year with a guest post from my friend, author and resiliency guru Eileen McDargh who has written a wonderful new book called Your Resiliency GPS – A Guide for Growing Through Life & Work. She mentions several necessary resilience qualities that are the natural strengths of introverts; listening and humility. As I reported in the book Quiet Influence, Introverts take the time to gather information through focused conversations and emerge with the well researched viewing points that Eileen McDargh describes here. If you seek to increase your business, develop new products or services, gain market share, or keep great talent, you will need to develop the skill of adaptability, a critical component for resilient leaders. One way to increase adaptability, is to constantly seek viewing points. Viewing points, on the other hand, require that you actively seek information from many sources and often from people with whom you rarely interact. Such people could be front line personnel, customers, friendly competitors, and maybe even—children! One software company went into a 5th grade class and demonstrated what the software could do. The questions from those 10 year-olds showed faults in the system that the engineers had never consider. Easy to say. Harder to do. Particularly if you are doing well. Remember Kodak? Howard Johnson restaurants? Almost half of the companies included in the rigorous research for “In Search of Excellence” are gone. Of those companies first chosen for Standard & Poor’s (S&P) 500 list, only 15% remain. What happened? According to Sydney Finkelstein’s book “Why Smart Executives Fail”, companies that have failed often knew what was happening but chose not to do much about it. In short, few challenged the status quo and asked the tough questions. They became locked into a viewpoint. Intense curiosity to constantly learn. Consider these questions as catalysts to open a 360-degree window of possibilities for the New Year. Imagine that you are at the top of a lighthouse and you want to see all around you. What is in front might be very different from what is beside you. Test the status quo. Where might you be “too comfortable”? What will it take for you to seek that viewpoint? What are sacred cows that might bind your hands? Are they really “sacred”? How can you test that belief? When you hear another viewpoint, how can you incorporate that into your panorama of options? Remember, just as there are four positions on a compass, there are at least four viewpoints. What small steps can you make to move you in the direction of your choosing? What is your GPS- growth potential strategy? Welcome to 2015—a world of new beginnings nurtured through viewing points. Eileen McDargh is the founder and CEO (Chief Energy Officer) of The Resiliency Group and McDargh Communications. She helps organizations and individuals energize the life of their business and the business of their life by developing skills to respond to constantly changing professional and personal demands. 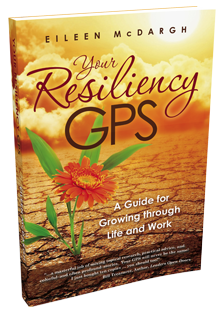 Her newest book, Your Resiliency GPS – A Guide for Growing Through Life & Work has been met with high acclaim as an organizational resource. This entry was posted in Uncategorized on January 1, 2015 by Jennifer Kahnweiler.